Imagine you're driving through an English village and come across a board stating "Castle and Moat for Sale". What would you do? I know what my first reaction would be, or even my second one. But I've never been lucky enough to come across a board like that. Derek Batten, on the other hand, not only came across that very board, but he went on to buy the castle (and moat). Even though the castle was more of a wood-covered hill and the moat was dry. Still, his purchase – Alderton Mount in the little village of Alderton in Northamptonshire – turned out to be one of the many Norman castles in England. 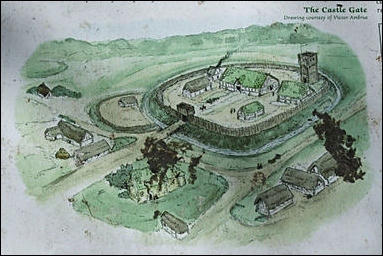 It was most likely a defensive ringwork as shown above, rather than a stone castle, but its position was carefully chosen and - in a time before multi-storeys, church spires and electricity lines - it would have dominated the landscape. A few years ago, owner Derek Batten invited TimeTeam to dig the Mount to help uncover more of it's history. You can watch the program they made about the dig in this YouTube video. Whether it's Fray Bentos Steak and Kidney Pudding, suet for making pastry, Oxo cubes, real Christmas Pudding or Twinings Tea, I field a lot of questions from expats and England lovers alike where to buy English food and ingredients abroad. You have the trickiest import restrictions and they vary from state to state. For that reason, many traditional foods cannot be shipped from the UK. Also, delivery times tend to be longer and shipping rates can get expensive. Fortunately, there are numerous English food stores in the US and Canada - and most of them sell through amazon, which seems to take care of most of the regulatory issues and brings both delivery times and shipping costs right down. So rather than recommend a single merchant - which I can't really do since I haven't tried them out myself - I've gone with amazon, whom I've used for many years. And to help you find all manner of English foods quickly and easily I've created English Food Abroad, a collection of English foods and ingredients, all readily available without hassle and import problems. 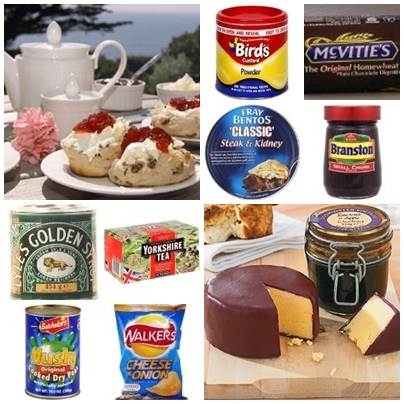 Tea, biscuits, snacks, tinned foods - yes, Fray Bentos is available in the US -, pickles and relishes, cooking and baking ingredients like suet, Yorkshire pudding mix, custard powder and Oxo cubes, and even English cheeses (really worth checking out!) are available and I'll be adding more as I find them. Regulations are a little less stringent here, and many UK merchants happily ship to European countries. Which is find if you're an expat Brit knowing exactly what you want. If you're not, you might like to check out The British Corner Shop. They have a solid reputation and stock everything from food and drink to cosmetics and household chemicals - even baby food and products! They also carry a selection of souvenirs and seem to have plenty of special offers if you want to stock up for a party or special event. They do deliver world-wide, but I'm told that shipping charges can be quite hefty, so it might make sense to club together with friends and neighbours and do a large shop if you need it delivered half-way round the globe. Struggling here ... despite many enquiries I haven't teased out a good answer for this area yet. 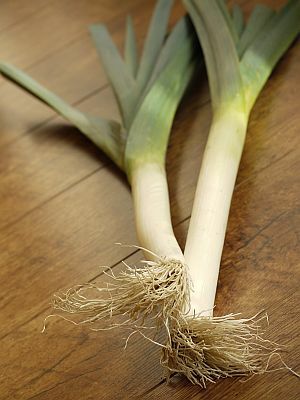 I love leeks. They're one of the most versatile vegetables around, fitting happily into soups, quiches, bakes, burgers and pasta sauces. Baby leeks wrapped in bacon and grilled look great at dinner parties and buffets, and they make great-looking vegetable side dishes - simply steamed and decorated with bacon bits, or chopped coriander. Since the season for home-grown leeks is almost over, I thought I share this nutty, cheesy, leek crumble recipe with you. It's fine as a mid-week supper with new potatoes, but it also makes a great side dish for a roast dinner. Whichever way you serve it, it will be delicious. Pre-heat the oven to Gas 4 / 180°C / 350°F. Loosely cover the dish and bake for 20-30 minutes until the leeks are tender. How long it really takes depends on how thick your leeks are, so keep checking. When they're done, the liquid in your dish should be almost gone and the leeks should be soft, but hold their shape. While the leeks are cooking, combine breadcrumbs, walnuts and cheese. You can use more cheese if you want - I usually do - but 50g should be enough to give you a nice cheesy taste. If you don't have Cheddar, then Red Leicester works well, too. We've also made it with mature Gouda, Emmenthal and Gruyere. When the leeks are tender cover them with the crumble mixture and put back in the oven, this time uncovered. Bake for about 15 minutes, but keep checking to make sure the topping is crispy and the nuts don't burn. Serve with new potatoes, garlic bread or a roast dinner. And why not join us on Twitter and LIKE us on Facebook? I'll be very happy to see you!